Napoleon's final stand (before the 100 days) came at Leipzig, where, October 16-18, 1813 he waged a three days' Battle of the Nations, against all the powers of central and eastern Europe. Then, his ammunition nearly exhausted, he was forced to give the order to retreat. 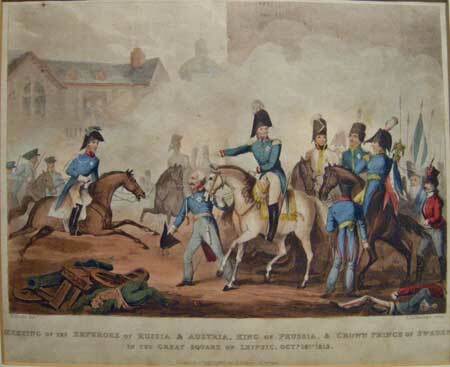 Leipzig, was one of the most decisive defeats suffered by Napoleon. The battle was fought on German soil and involved German troops on both sides, as a large proportion of Napoleon's troops actually came from the German Confederation of the Rhine. The battle involved over 600,000 soldiers, making it the largest battle in Europe prior to World War I.
Knocked back on his heels, Napoleon returned to France, while the Allies kept their momentum, invading France early the next year. Napoleon was forced to abdicate, and was exiled to Elba that spring. The Allied victory at the Battle of Leipzig (also called “the Battle of the Nations”) saw the end of French influence in the German States. The battle, fought on 16-19 October 1813, was the largest battle of the Napoleonic Wars and also marked the beginning of the end of Napoleon I’s First Empire (excluding the short-lived Hundred Days in 1815). 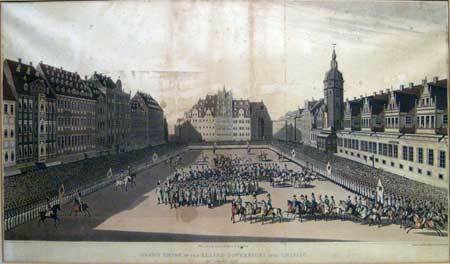 Leipzig – along with the Battle of Waterloo (18 June 1815) – ranks as one of the most controversial battles of the entire Napoleonic Wars. William Heath 1795-1840 was a noted draughtsman, etcher and lithographer of Military subjects and caricatures mainly after his own designs. Thomas Sutherland was a prominent aquatint engraver of military and sporting subjects after his contemporaries in this case after designs by William Heath. Published in J. Jenkins Martial Achievements London 1815. The Emperor Alexander; Lieut. Genl. Lord Visc. Cathcart, Genl. Sir Robert Wilson & Genl. Moreau, at the BATTLE BEFORE DRESDEN. Augt. 24th. 1813 at the moment Genl. Moreau receeved [sic] his death wound. The general is exclaiming as he falls C'est mon Sort! 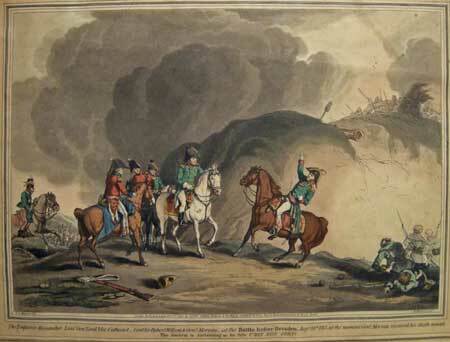 The general staff, were just as vulnerable as the common soldier whilst on the field of battle in Napoleonic times as is dramatically depicted in this fine aquatint. Fate had not dealt Moreau death just yet, as it was several weeks later, (following the Battle of Dresden) that he finally succumbed to his wounds. Jean-Victor-Marie Moreau (born Feb. 14, 1763, Morlaix, Fr.—died Sept. 2, 1813, Lahn, Bohemia), was a leading French general of the French Revolutionary Wars (1792–99); he later became a bitter opponent of Napoleon Bonaparte’s regime and joined the allied forces in 1813. 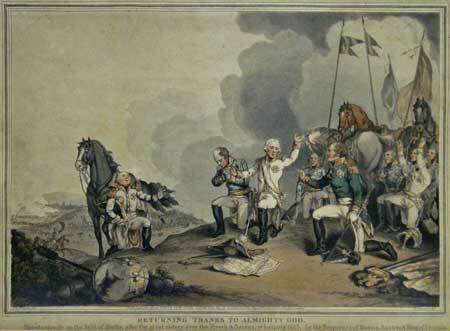 Spontaniously [sic] on the field of Battle, after the great victory over the French and Saxons, at Leipzig 1813, by the Emperors of Russia, Austria & King of Prussia. Miniature portraits of the victors of Battle of Leipzig, have been placed on the carefully posed bodies of the general staff, with the field of battle in the rear. A captured French eagle standard lies beside them. "The effects of the Allied victory at Leipzig were truly momentous. It had smashed Napoleon's stranglehold on Europe for good, opened up European markets for external international trade for the first time since the Berlin Decree six years earlier, destroyed the Confederation of the Rhine, liberated Germany, catapulted Prussia into the ranks of the Continent's leading powers, and laid the basis for the final defeat and dethronement of Napoleon and the restoration of the Bourbons. The blind faith which thousands had previously placed in the Emperor also began to fade. " Shares of government stock fell in France by 30 % following the battle of Leipzig. Digby Smith - "1813: Leipzig - Napoleon and the Battle of the Nations"
Original hand tinted aquatint, some browning and condition issues. Published in BOWYER, Robert (1758-1834)] An Illustrated Record of Important Events in the Annals of Europe, during the Years 1812, 1813, 1814, & 1815. Comprising a Series of Views of Paris, Moscow, the Kremlin, Dresden, Berlin, the Battles of Leipsic, etc., London: T. Bensley, 1815. Robert Bowyer (1758 - 1834) was a devout Baptist miniature-painter with royal court connections. His fame as an artist was supplemented by his labours as a publisher of lavishly illustrated works. In 1792 he issued a prospectus for a “superbly embellished” edition of David Hume’s “History of England”. 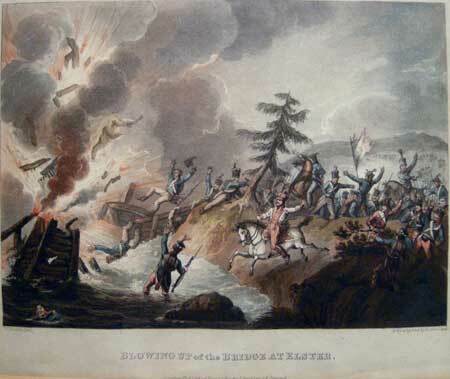 The aim of the illustrations was defined as being “to rouse the passions, to fire the mind with emulation of heroic deeds, or to inspire it with detestation of criminal actions.” Bowyer commissioned leading artists, including Tresham, Smirke, Opie, and De Loutherbourg, and spared no expense in obtaining the finest engravings, many by Bartolozzi. Unfortunately the country was at war with France and this meant that the project was a financial failure: Bowyer suffered a severe loss. But he again built up his business as a dealer in prints and publisher of expensively illustrated volumes, this image being illustrative of one of the latter. Although his magnum opus, the famous “Bowyer Bible,” was never published - though this was his intention. The text of which was taken from an 1800 edition of Macklin’s Bible, which was then the most lavishly illustrated available. Bowyer printed his own title-page (dated 1826) and by the addition of more than six thousand engravings expanded the Macklin Bible of seven volumes into no less than forty-five volumes. The whole set was, and still is, housed in a magnificently ornate oak book-case measuring eight feet six inches square. It is now kept in the Central Museum and Library Archives, Bolton, England.